The two week long Chithirai Festival is one of the biggest celebrations in Madurai. It reenacts the wedding of Lord Sundareswarar (Lord Shiva) and Goddess Meenakshi (Lord Vishnu's sister). Traditionally, Lord Vishnu has high caste followers, while Lord Shiva is worshiped by those of lower castes. What's interesting to note is that Meenakshi's marriage to Lord Shiva unites people of all castes, hence bridging the caste gap. It begins on the fifth day of the bright half (waxing moon, from new moon to full moon) of the Tamil month Chithirai. This falls in April/May on the English Gregorian calendar. In 2019, the dates of the Chithirai Festival are from April 8-22. The festival begins with a flag hoisting ceremony on the first day. However, the most important celebrations occur towards the end of the festival. After the celestial wedding, the location shifts to Kallazhagar Temple (also known as Azhagar/Alagar Kovil) in the Azhagar/Alagar Hills near Madurai, where Lord Vishnu presides as Meenakshi's older brother Azhagar (also known as Lord Kallazhagar). 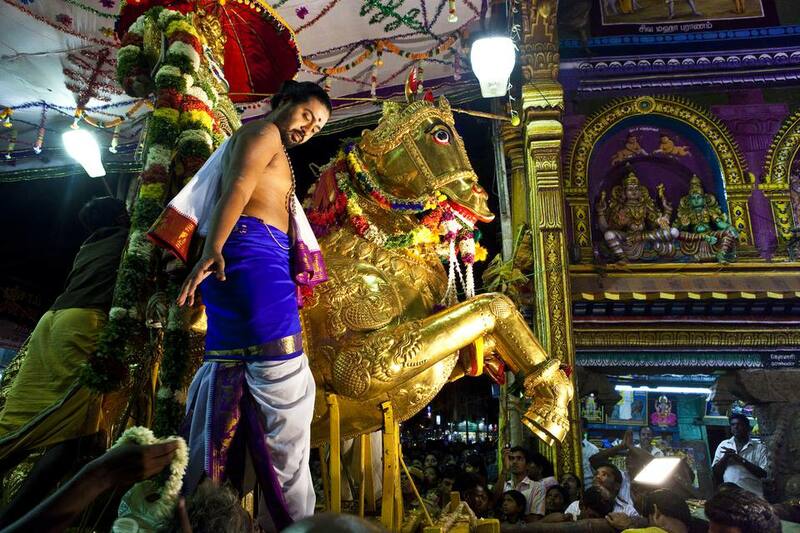 Legend has it that Lord Kallazhagar traveled on a golden horse to participate in the celestial wedding of his sister Meenakshi. Unfortunately, he gets delayed and misses the wedding. Meenakshi and Lord Shiva come to the Vaigai River, where he reached, to try and pacify him. However, in his fury he gets into the river to give them his gifts, then goes back home without visiting Madurai. One of the biggest spectacles of the Chithirai Festival is this procession, particularly the moment that Lord Kallazhagar enters the river. The wedding commences around 9 a.m. and is held on a flower-laden stage that's set up inside the temple compound. Up to 6,000 devotees are let in, on a first-come-first-served basis, for free through the temple's south tower. Alternatively, devotees can purchase tickets of varying denominations (200 rupees and 500 rupees) for entrance through the north and west towers. These tickets are available online from the temple's website or in person at Birla Vishram on West Chithirai Street. There are special arrangements for foreign tourists to see the celestial wedding and the car festival the next day, including dedicated viewing areas. A representative from the Tamil Nadu Tourism Department escorts the foreigners from the tourism office to the venues each day. The office is located at 1 West Veli Street, Madural. Go there or contact them on (0452) 2334757 for more information. After the wedding, a grand feast takes place at Sethupathy Higher Secondary School. The Chithirai Festival is a great opportunity to experience local life in Madurai and see a traditional Hindu wedding ritual. It attracts huge crowds of people, who flock to Madurai from surrounding areas. The festival is celebrated with a great deal of excitement and hype -- with the enthusiasm of a real wedding. The celebrations extend all over the city, and the streets are flooded with devotees. In addition, an annual Chithirai exhibition is organized by the government at Tamukkam Grounds, on the city's northern side. Go there to experience a fun local fair, complete with Ferris wheel. Most the activities take place outdoors and the weather will be hot, so wear light clothing and comfortable shoes. Also be sure to carry water and sunscreen. The car festival commences at 6 a.m. and goes on for about five hours. Take extra care of your belongings, such as wallet and camera. It's easy to lose them in the crowd. Visiting Madurai for the festival? heck out these top attractions in Madurai.